All are invited to attend FOR OUR EARTH: PRAISE HIGH OUR COASTAL HEROES, to be held Sunday April 14th from 10 a.m. - 4 p.m. at the Brilliant Cultural Center at 1876 Brilliant Road in Castlegar. This inspirational event is framed to uplift, fund-raise and pay tribute to the courageous people who have been shouldering our transition to renewable energy and a healthier future by protecting our province from the proposed expansions of tar sands and bitumen pipelines and tankers for export. 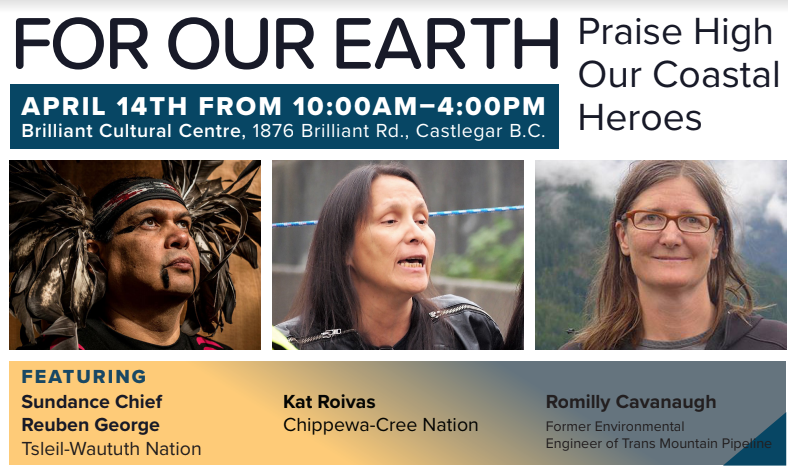 The event will feature guest speakers Sundance Chief Reuben George of the Tsleil-Waututh Nation, Romilly Cavanaugh, former environmental engineer of Trans Mountain Pipeline, Kat Roivas of the Chippewa Cree Nation, a large panel of guests with Q and A from the Lower mainland, a big drum tbc and Sinixt spiritual advisers from the Confederated Tribes of the Colville Reservation, a Doukhobor led multi faith prayer ceremony with emphasis on prayers for Mother Earth, a vegetarian pot luck luncheon, congregational singing, informational displays and a silent auction fundraiser for Protect the Inlet and Coast Protectors. FOR OUR EARTH invites all to to graciously contribute to and participate in the silent auction and to share the protectors' donation links with your contacts and on social media so that the campaign continues to grow. Our Coastal heroes continue the struggle daily in court and in the media so all heart felt contributions are much appreciated.